Second level units in Indonesia are regencies (kabupaten) and third level units are districts (kecamatan). There are additional municipalities (kodamadya) as second level units and administrative towns (kota administratif) as second and a half level units (less then municipality more than district). However, I have visited probably all websites of Regencies and Municipalities, or most of them, and I have never seen a flag of a regency or of a municipality. The only exception is Bandung municipality, which flag I sent last year. That makes me think that there is a process of adopting local flags, and probably we'll find them in the future. I just saw an old ZDF (German TV) documentary dating from 1971, where the then new head of state of Indonesia, Suharto, visited Borneo (= Kalimantan). 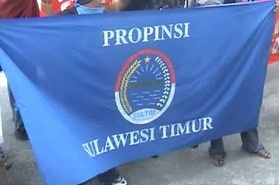 Clearly in sight a light blue-black-white horizontally striped flag. As far as I know, East Sulawesi province (Sulawesi Timur) is just a proposal, but it might be that it was created recently. It is reported at http://www.indonesialogue.com/destinations/east-sulawesi-to-become-a-new-province.html. However, the flag already exists. It can be seen on a photo here.